Neocortical radial glia cells develop from neuroepithelial cells and give rise to neurons and glia (oligodendrocytes and astrocytes). 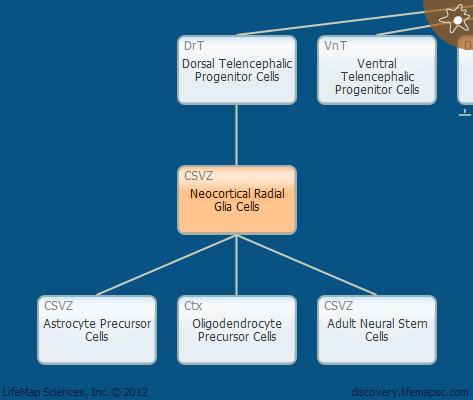 At late-embryonic and postnatal stages, neocortical radial glia cells give rise to adult neural stem cells. Radial glia cells morphologically resemble neuroepithelial cells with a long basal process in the outer (pial) surface and a shorter apical process that contacts the lumen of the ventricular zone. However, radial glia can be distinguished from neuroepithelial progenitor cells by the expression of astrocytes markers such as Blbp, Glast. Radial glia cells severe as a scaffold for neural migration and guide newborn neurons towards their final destinations during central nervous system development. During late embryogenesis, radial progenitors undergo a transition from a neurogenic to a gliogenic mode.